WILDCOAST’s Oaxaca Sea Turtle Conservation Project will protect the unique natural and cultural resources of adventure travel destinations along approximately 65 miles of the Oaxaca coastline in southern Mexico by: promoting the official protection of 9.3 miles of nesting beach for Olive Ridley and Leatherback turtles; improving sea turtle monitoring on key nesting beaches; continuing an oil spill response program for oiled wildlife; providing sea turtle conservation outreach, education, and stewardship activities for local indigenous communities; and enhancing ecotourism infrastructure in the indigenous community of Rio Seco. The ATCF and its members have awarded Wildcoast $20,000 for long-term protection of an environmental resource, wildland, waterway or threatened species along the Oaxaca coastline in Mexico. Oaxaca Sea Turtle Conservation Project will help conserve some of the most important sea turtle nesting beaches in the world; those found along approximately 65 miles of shoreline on the southern Mexican Pacific coast. This region, with its thriving outdoor tourism opportunities in diving, snorkeling, surfing, bird watching, and artisanal indigenous crafts and culture, is also home to critical nesting grounds for five species of sea turtles. The beaches of Morro Ayuta, Barra de la Cruz, among several others are particularly important for Oliver Ridley and Leatherback turtles. On the 9.3-mile beach of Morro Ayuta, over 1.7 million Olive Ridleys nested during the 2017 arribada, or mass nesting, season, making it one of the most important known site on the planet for this species of turtle. Unfortunately, poaching, habitat loss, and climate change pose increasing pressures on the region’s natural coastal areas and wildlife. The poaching of sea turtle eggs and potential habitat destruction due to unplanned coastal development are direct threats to sea turtle survival and their habitat. Hatchlings and nesting females are also vulnerable to increasing sand temperatures, sea level rise, increased storm frequency and intensity, and changes in predation patterns. In addition to the direct pressures these threats place on the turtles and their habitat, they also undermine the region’s natural beauty and resources that attract visitors from around the world. 2,000 Zapotec and Chontal children in five communities educated and engaged in sea turtle conservation. 400 people prepared in oil spill response and the management of oiled wildlife, including sea turtles. Improved visitation infrastructure in the indigenous community of Rio Seco and Morro Ayuta that includes signage, trails, viewing areas and maintenance. WILDCOAST conserves coastal and marine ecosystems and wildlife. In 2017, we will keep conserving special wild places including: Baja’s Pacific Islands Biosphere Reserve, a brand new 2.7 million-acre wildlife reserve offshore from Baja’s Pacific coast, that we advocated for over the past five years; Laguna San Ignacio, a pristine gray whale birthing lagoon where we have helped to conserve 450,000-acres of habitat; Magdalena Bay, a lagoon that provides sanctuary for gray whales in Baja, where this year we helped to conserve over 182 miles of shoreline and 3,709-acres of mangrove islands; Morro Ayuta beach in Oaxaca, where our team is busy protecting the more than 600,000 Olive Ridley sea turtles that nest there each year; and the coast of California, where we are leading the effort to manage over 500,000 acres of marine protected areas that are home to elephant seals, gray whales, black sea bass, green sea turtles and the elusive leopard shark. Restoring Patagonia for future generation. 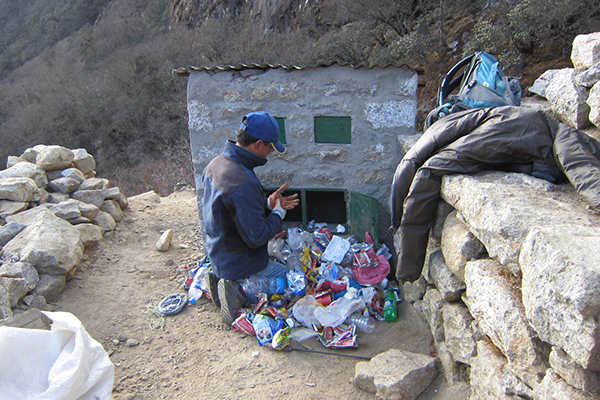 Waste management in the Himalayas. Conserving Mexico's coastal & marine ecosystems.